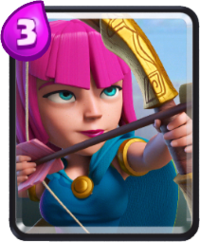 Clash Royale is SuperCell’s latest strategy card game! It is a mix of hearthstone and clash of clans. It is extremely fun and requires a bit of quick thinking and strategy to defeat your opponent. Its a tower defense with 2 towers and a castle for each player. You are both separated by 2 bridges in the middle. You have access to a deck of 8 different cards. 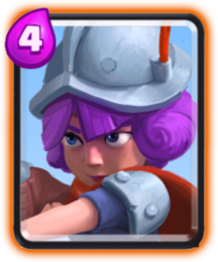 There are different types of cards such as spells, troops or buildings. Your goal is to use these cards to your advantage and destroy the enemy’s tower or castle. After 3 minutes, if both players are still in a stale mate, then it is a draw. You gain pvp points when you defeat an opponent. Playing against higher ranked opponents will net you more points if you win. You also lose less points if you lose. Now this game has a very advanced rock/paper/scissors type of mechanics to it One card will beat another one but only if you use it at the right time. There are common, rare and epic cards. Now, just because a card is epic doesn’t always mean its better. They can still be beaten if you play your cards right. Let’s take a look at the starter cards. Archers – 2 of them are summon at the cost of 3 elixirs. Useful against air units. Do not use them as a front line or they will die quickly. Knight – A medium sized front line fighter that is useful at soaking damage and deal some decent damage. You can use him to tank groups of small troops or have him go first to tank damage for your ranged attackers. Does okay damage to towers. Mini P.E.K.K.A – A stronger attacker that does a lot of damage to towers and single enemies. He will attack anything closest to him. That means he will switch targets and usually to the closest enemy or tower. He is vulnerable to small groups of enemies. 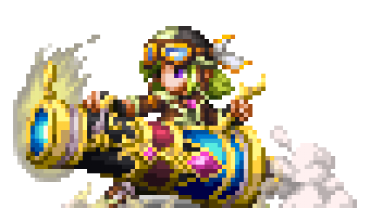 Baby Dragon – An air unit that deals small AoE splash damage. Does will against small troops but is vulnerable to Musketeer and Tombstone. Deals decent damage to targets. Musketeer – Ranged attacker that counters air targets. A great unit to counter the Baby Dragon as long as she isn’t tanking damage. Use someone like the Knight or Giant to be the meat shield. Giant – Ah, the tower and building attacker. He ignores troops just like in Clash of Clans. He has high health and can take a beating. He does well against buildings once he gets to them. He is very slow and can be countered easily by massive small troops. You can pair him with the witch or ranged attackers like the musketeer, archers or spear goblins for some good damage. Arrows – Your first available spell card. Deals huge AoE damage to a select area. Does well against small troops, especially the skeleton army and goblins. It does require good aiming though. It has a 3 second delay, so if you mistime the area, you can miss your targets easily. Does poor damage to towers and buildings, but it does have a huge radius to hit both the tower and the castle. Fireball – A spell card that is a stronger version of the arrow, but with a smaller radius. Does good damage against small and medium troops like the barbarians or witch. This is your beginners deck. I actually climbed to arena 3 with this. Along the way, you will get more cards that you can mix and match to your own liking. Since it depends on luck as to which other new units you get, I will just list some tips to help you get the mechanics down. Since you have 3 minutes to battle and you can wait about 5 seconds or so before your elixir charges to 10. You have 2 choices here, you can wait until your opponent makes a move first or you start using your card combos. 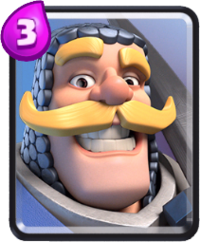 Giant + Musketeer – This works well if your opponent uses small troops or knights as their first move. Using this means you are vulnerable to small troops attacks on the other side of the map. Knight and Archers – A weaker version of the above combo. But it gives you the flexibility to defend yourself with some spare elixir. 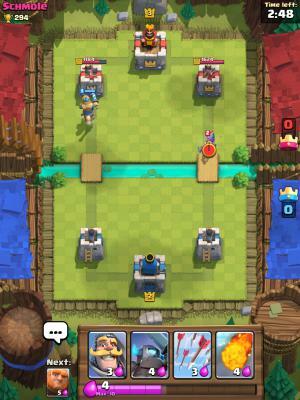 Bait and Switch – Put a knight on one side and wait to use Mini P.E.K.K.A on the other side when they use troops or spells to defend against the knight. Try different card combos for this strategy. Troop Rush – This works if you can get either the Tombstone, Goblin Barrel, Barbarian or Goblin Hut. Start stacking them up and eventually you can over-run your enemy. Doesn’t always work, but when it does, you can destroy the castle easily once you overwhelm them. Trading Towers – This will require some judgement and experience. It’s either you all in or you don’t. If you think your troop will deal more damage than theirs, you are welcome to trade towers. Cards – You can buy common, rare and epic cards with gold from the treasure chest area. The cards you can buy is random and it refreshes every 24 hours. Tower buildings are harder to get and require you hit higher arena levels(4 or higher) to unlock. For free to play players, it will take a while. I will be updating the guide as I progress further in the game. Also remember to join a clan and request common cards to level them up faster.